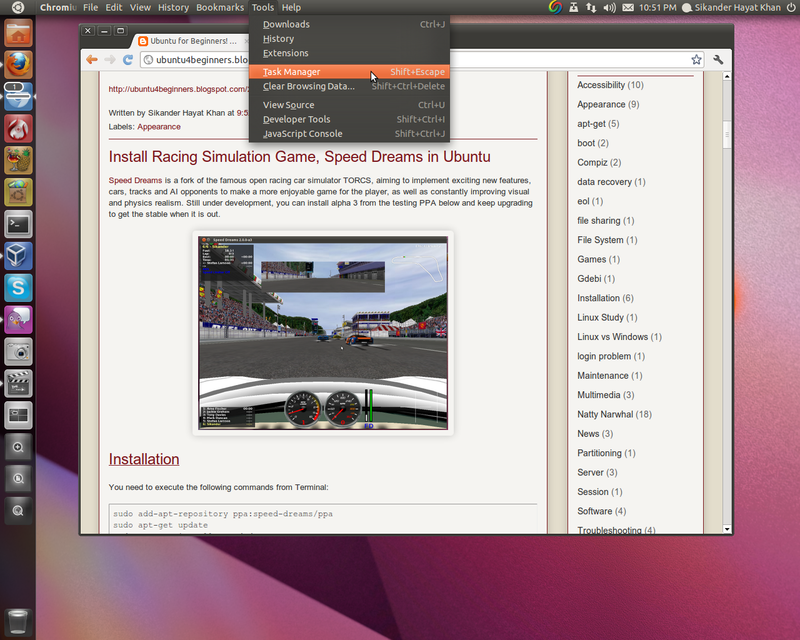 Unity specific features have been landing in Chromium browser since the release of Ubuntu Natty. The latest Chromium from chromium-daily PPA comes with Global Menu and download progress badge support under Unity. But notice that installation from chromium-daily PPA would result in the related packages being updated every 24 hours and nearly 25MB of updates would be coming your way daily. If you don't want to upgrade your system that often, as a workaround, you can disable the chromium-daily PPA from Software Center > Edit > Software Sources > Other Software tab after the completion of installation. Then you can enable it on weekly basis and again disable after applying the updates. Scroll to the bottom of the page where you see an option for 'Experimental GNOME menu bar support. ', enable it. You'll need to restart Chromium for the changes to take effect. If you notice, you can see the download progress indicator on Chromium icon in the Launcher in the screen-shot above.